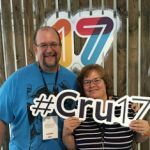 Campus Crusade’s National Staff Conference (known as “Cru17” this year, or simply “CSU” for the Colorado State University campus which hosts us) is a biennial gathering of all the North American full-time, supported missions staff of Cru, with our families. Cru17 was our seventh one to attend, and the first to be hosted “in the round” in the (8,745-seat) “Moby” gymnasium which serves as our forum for all the general sessions. “I want to tell you that what you’re doing is the front lines of ministry. You are doing the work that Jesus commissioned the very first disciples to do, and you’re doing it all over the world,” author and “IF:Gathering” ministry founder Jennie Allen stated as she began her testimony in one of the General Sessions. “I am a product of Crusade…” she told us. Mentioning the ministry she founded, she added that if she hadn’t been discipled in college, that would not be her story. Her Cru leader taught her to love God’s Word and make it central, rather than investing in elaborate methods and programs. The next speaker was Dr. Steve Douglass, our president, who spoke in similar terms about partnership. It’s at it’s best when all have selfless humility, common vision and a commitment to action. At a 2000 worldwide evangelization conference, Dr. Douglass and other evangelical leaders heard a speaker’s challenge to “adopt” the remaining 232 “untargeted” people groups of over 1,000,000 in population. As others finished their commitments, Dr. Douglass turned to the others at his own table and offered, “let’s take the rest.” There were still 140 left! But his table included leaders of YWAM, Wycliffe, TransWorld Radio and the International Missions Board of the Southern Baptist Convention. They agreed, and the “Table 71 Partnership” was born. It has meant historic cooperation between these, the largest missions organizations in the world. He shared that, today, there are only six groups remaining fitting the original description (over 1M population, no workers, no resources and no plans to reach the people). Emily and Luke served in the childcare program. We’ve been told that during the time it operates, Cru’s “Kids Camp” is the largest daycare in the USA. Emily and Luke always enjoyed it when they were children. This time, they got to be leaders of the next generation of children! It also became a reunion with many of their friends from TEAM, our Florida homeschooling co-op. 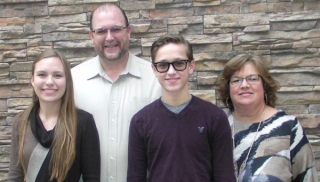 On the way home, we visited prayer warrior Online Missionary friends in Oklahoma, Ruth and Diana Stewart. They served us a home-cooked lunch and shared photos of their trip to Israel, praying with us afterward before we headed back to Anna, Texas.